On October 31st 2016, the Adform api related to campaign statistics will change. The Campaign Statistics Service and Campaign Performance Report Service will no longer be available and will be replaced by the Adform reporting stats api. We’ve included this update in a new release of the adform dashboard. Our Big Data Engine has recently been updated to anticipate on this change. It now presents the Adform data in the Adform dashboard tab, using the Adform reporting stats api. We’re looking into options to expand the Adform dashboard further by adding custom segments, and more. If you have specific Adform related needs, just let us know and we’ll be more than happy to look into it. See an example of the Adform dashboard, built with Klipfolio’s powerful dashboard visualisation technology below. For agencies, we offer fast and easy deployment of Klipfolio dashboard tabs. See the list of dashboard tabs and datasources we offer at www.cervinoboard.com. 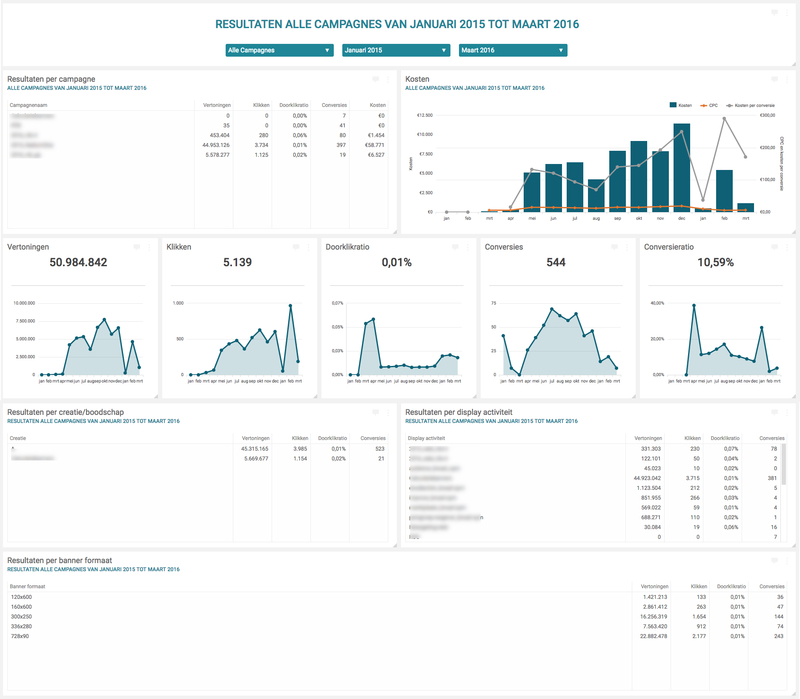 Also check out our new multichannel dashboard, wich includes Adform as a datasource. Our new and improved Adform dashboard tabs presents the statistics you would like to look at every day, like the Impressions, Clicks, CTR, Conversions, costs, cost per conversion and CPC split by Campaigns, Message, Display activity and Banner format. It shows the totals for all campaigns for a quick overview yet it also shows specific campaign details for a quick deep dive. See the trend over multiple months or deep dive into one month and see the trends per day. This dashboard tab is all you have to give to your clients to let them feel in control over the campaigns you run on their behalve without overloading them with information.